When I first got my smartphone, I couldn’t wait to download apps. I’ll admit that the first app I downloaded was a game: Angry Birds Space. Since that first download, I’ve installed many, many more apps. A few I use often, some sit on my phone mostly unused, and some were uninstalled rather quickly. I’ve come to enjoy finding clever, useful, or just plain interesting apps, especially if they are ones that aren’t that famous. I’m going to begin a series of app reviews. Some might be ones everyone has heard of and some might be more obscure. Some might increase your productivity, some might increase your creativity, and some might distract you with fun gameplay. 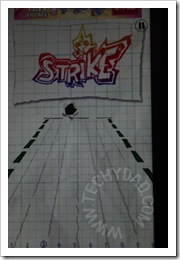 Though I’ve downloaded many games, I recently realized that I hadn’t gotten any bowling games. Now, I love bowling. Some of my fondest memories of my grandfather are of him attending my bowling league games and giving me advice… and then giving the other team advice when I refused to listen to him. It’s the sort of thing that was annoying then, but makes me sentimental now. So off I went to the Google Play store to look for a bowling game. 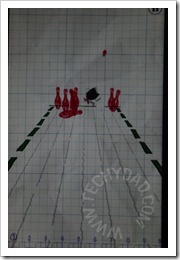 There were many to choose from, but one leapt off the page, so to speak: Doodle Bowling. 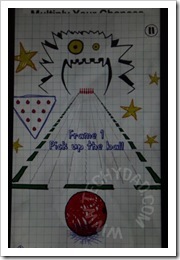 When you load up Doodle Bowling, you are presented with some graph paper and a crudely drawn ball. At the far end of a pair of lines are ten pins. You "pick up" the ball by pressing on it and then flick your finger upwards to launch it at the pins. In addition, by rapidly swiping your finger left or right, you can put some spin on the ball and direct when it finally ends up. 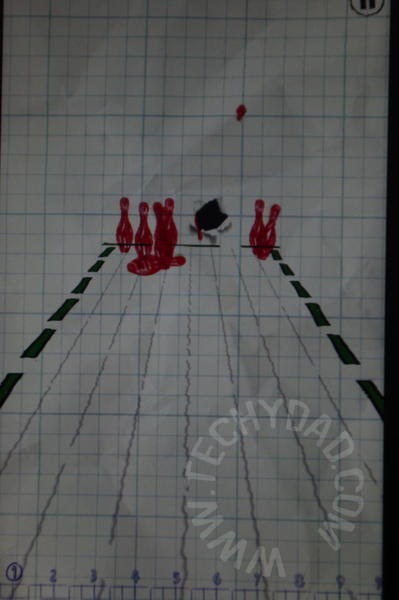 As the ball hits the end of the lane, it "rips" through the paper, sending pins scattering. 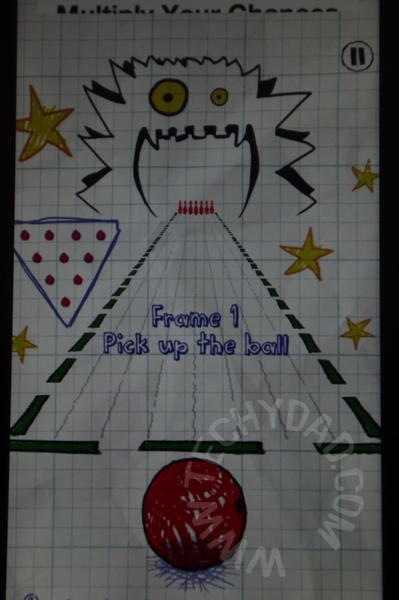 The goal of the game is the same as normal bowling. Knock down as many pins as possible. Your score is tallied just under the lane and is displayed at the end of the game. By itself, this would be fun, but might get old quickly. 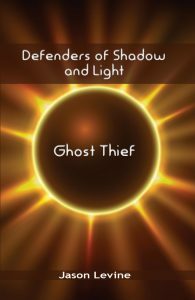 To increase the replayability, there are many different themes to unlock. One turns your "graph paper lane" into a chalk board (pins disappear with a puff of smoke). One brings your bowling experience into outer space. One even lets you bowl in a normal, ordinary bowling alley. Each play earns you one credit. Each theme costs a certain number of credits. Therefore, there is an incentive to play the game over and over to unlock all of the themes. What I most like about this game is that it is fun, quick, and simple. A single game of bowling takes about two or three minutes. There is a definite joy when all of the pins fall down and that "Strike" or "Spare" banner appears. Finally, the controls are so simple that my five year old mastered them almost immediately. 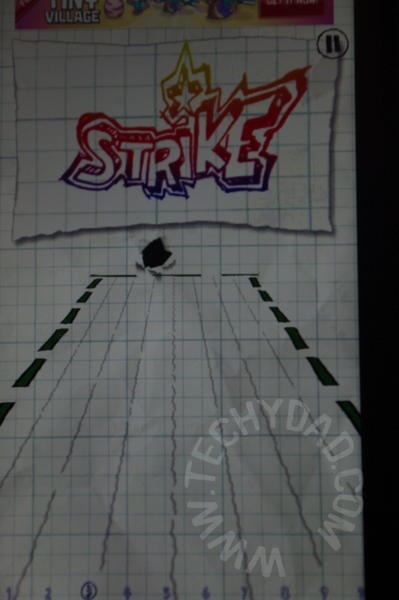 Since this is a free app, there are the requisite ads above the bowling action. However, I found these to be unobtrusive and not easily clicked by accident. (All of your interaction tends to take place at the bottom of the screen while the ads are up top.) A few ads is a fair trade for the bowling fun. This is definitely a keeper and will surely provide the kids and I with many wonderful, pin smashing hours of fun – in 10 frame, 3 minute chunks.